Where 1978’s Halloween broke through cultural norms to establish a heroine, 2018’s Halloween creates a fighting victim. This is a Halloween for now, bloodier yes, but putting Laurie Strode (Jamie Lee Curtis) in the path of her tormentor. Ignore the implausibility of a 70 year-old Michael Meyers on the rampage. His mask hides his age. Don’t ask where he gets his strength either. Chained in a prison for the criminally insane, going on 40 years, means he somehow never lost his muscle. It’s more important for this Halloween to use Michael for his irrational instability, and his stalking, composed method. 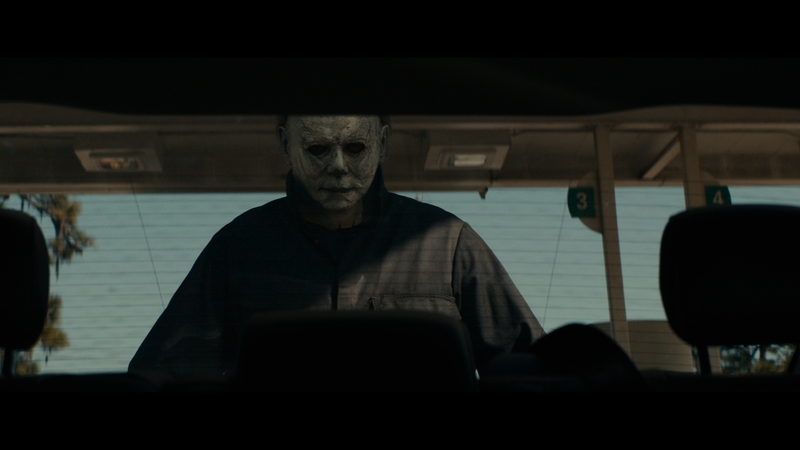 Halloween 2018 understands this franchise didn’t succeed on kills – it did so on tension. That tone bleeds over onto Strode, now nearly a hermit. She’s a survivalist, awaiting the day Meyers returns. A bit too conveniently, that happens exactly on Halloween night, right on the anniversary of Meyers’ original stabbing run. What Halloween does is capture the impact of victimization. Strode never lived a life that wasn’t in preparation. Her eyes never left her windows. Her doors never unlatched their locks. Curtis is perfect, still to this day. 2018’s Strode is ragged and unkempt, years of panic showing on her face. She’s ready to strike at the male oppressor who caused her untold terror. Victim-hood becomes generational. Strode’s daughter Karen (Judy Greer) suffers from childhood memories filled not with a healthy mother/daughter relationship, but preparedness with weapons, based on fear. Karen’s daughter Allyson (Andi Matichak) then inherits the same, despite Karen attempting to shield her kin from a world where Meyers in a reality. It’s a meticulous script, paced like a frenzied state of alarm. 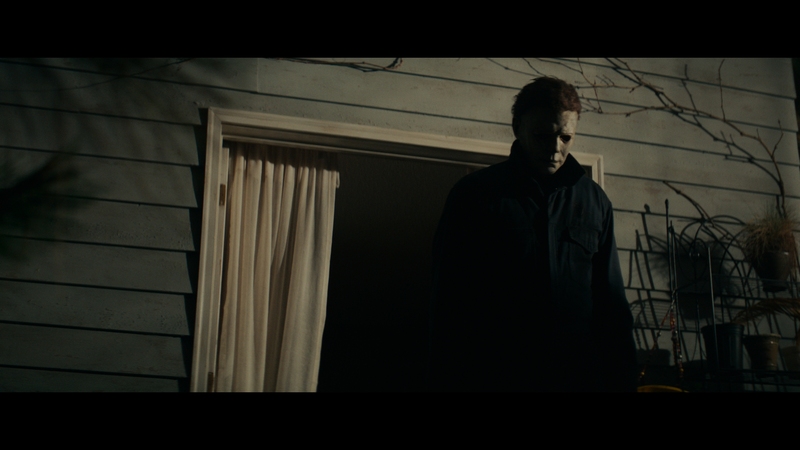 Once Meyers is loosed, Halloween mostly avoids direct visuals – kills happen off screen. Results matter more, the mind filling in grisly details. 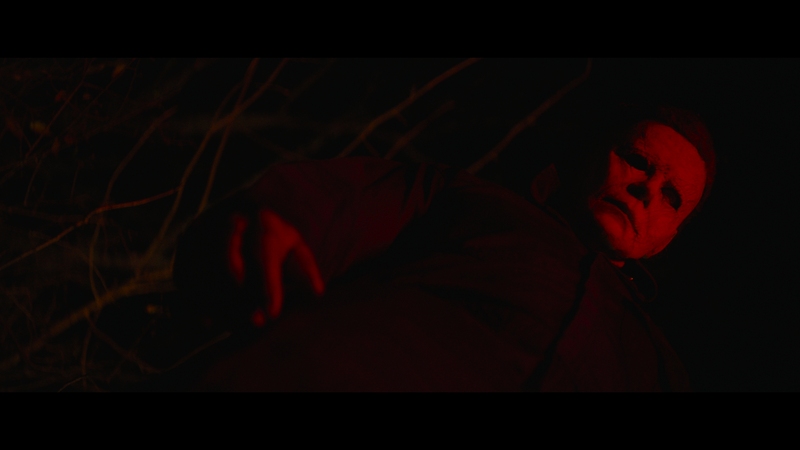 Careful too is the cinematography, including a master shot on Halloween night as Meyers goes house-to-house to find unlucky victims. It’s a sensational bit of slasher movie design. By the third act, Halloween goes as expected. It’s Strode and Meyers in a tussle, done with precise timing as to hold tension to the maximum. All empathy goes to Strode; where most genre entries turn the audience into cheer sections for the murderer, wiping out grossly cliché teens, Halloween ensures Meyers is raw evil. He represents thousands of abusive men, Strode the thousands of their victims. It’s brutal, vicious, unnerving, and simultaneously powerful. Note: A review of Halloween (1978) on UHD along with full resolution 4K screen shots is available to our Patreon supporters. The look of Halloween 2018 is defined by its use of limited light. The HDR pass is a small one, with highlights calmed to a natural state. Black levels matter more, slightly raised and avoiding use of true black. That gives Halloween an eerie, softer appearance, along with a vintage aesthetic from the digital source. Note this doesn’t fail in contrast; there’s plenty. Unexpectedly, color veers toward warmer tones. Typically, tension draws on blues, especially at night. Halloween upsets that trend, giving zest to its flesh tones and playing with primaries. Reds stick out as to best exaggerate blood. Exteriors of Haddonville mirror those of the original Halloween with fresh greenery around the characters. Transferred from a 2K source, Universal keeps this material free of defects. Clarity runs high. Aside from one roadside scene involving car lights and dust, noise is absent. So too is banding, an impressive bit of work. Not even the lighter shadows show fault. With the 2K material, texture resolves. Meyers’ mask is notably textural. Close-ups deliver on the potential of facial definition. Any shots of the suburbs nicely render grass, plants, and Halloween decorations. By way of cinematography, sharpness maintains stability. With strong contrast and depth, Halloween delivers a strong 1080p presentation. 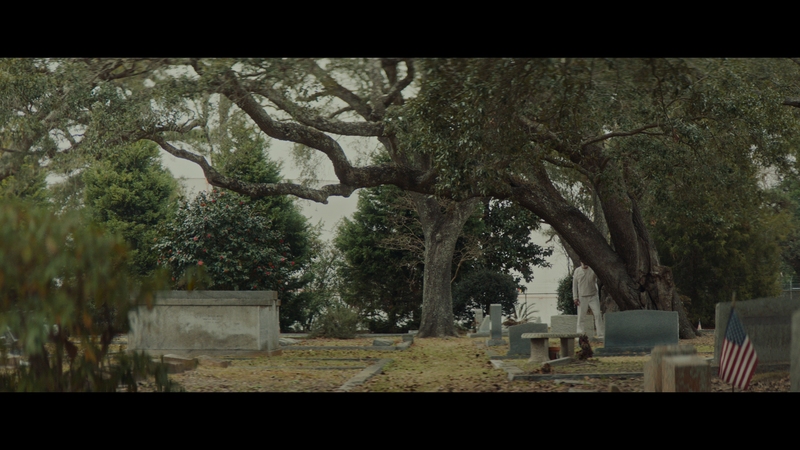 Black levels lift away from true black, giving the movie a faded aesthetic. The Blu-ray holds that well. A pleasing level of detail jumps from this clean transfer. Texture’s consistency means plenty of detailed close-ups. A small touch of banding is forgiven considering how small the issue is. When Halloween night falls and kids start running around, the activity kicks up. Surrounds fill in the soundstage with screeching kids, piling on the energy around a stationary Meyers. Awesome sound design there. Ambiance stays high throughout. School hallways liven things up. A dance event pushes into each speaker too. Smartly, the temptation to fill this DTS:X track with false scares and creaking wood is avoided. Mostly, it uses a lack of sound to suffocate with tension. LFE supports the score with a number of music stings. A revving motorcycle drives some energy into the low-end, and a final explosion ignites with plenty of power. Flames continue the rumble, a smartly reserved mix that excels when needed. A selection of seven extended/deleted scenes run 12-minutes, followed by five featurettes. They’re short. Back in Haddonfield runs six minutes, a dull EPK. Jame Lee Curtis gets her due in a brief two minute piece titled The Original Scream Queen. The Sound of Fear is the best of this lot, looking into the score’s composition with John Carpenter and his son. Three minutes isn’t enough. Diving into the mask’s design, Journey of the Mask looks at the design process and meaning. Finally, a short roundtable with Curtis, Carpenter, director David Gordon Green, and producer Jason Blum rounds out the bonuses. A smart and necessary follow-up to the 1978 original, Halloween reestablishes Michael Meyers but more importantly, Laurie Strode.